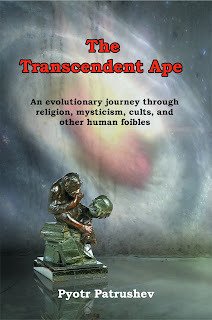 "I describe the human predicament in the bigger framework of evolutionary history: that of a mammal and a primate who was subjected to extraordinary selective pressures that led to his survival in the current form, with the potential for genocide and ecocide, as well as for the highest artistic and intellectual achievement." "This is a Big History of humanity’s inner predicament under the microscope, shining a sharp, personal, often humorous and sympathetic light on the foibles and follies of religion, mysticism and cults as well as on several millennia of constructive ratiocination about the human condition. Were Darwin alive, he could not have suppressed a gentle chuckle." "Pyotr Patrushev, writer and translator, a man who made a dramatic escape [across part of the Black sea] from Siberia when he was 20, a man who broadcast from the BBC and in Europe critically of the Soviet Union, a man once on a wanted list of the KGB, a man who sees himself as a peace maker and bridge builder between East and West. Pyotr's life-long search for meaning has taken him deeply into classical literature and into challenging, often painful self-analyses. His exploration led him from Christian Bible thorough the Transpersonal psychology schools of West coast USA to Daoism and the I Ching. When initiated by Maharishi Mahesh Yogi in 1968 he was asked whether he wanted peace or knowledge. He replied: "both please". And long after leaving the Transcendental Meditation he still cherishes those seemingly contradictory hopes...Pyotr was invited to interpret for high-level conferences between, for example Soviet and American scientists and leaders in alternative medicine and spirituality…We hear a man holding a mirror at the events of his life to see what may be reflected there of the inner journey. Because of his insight I think you may find Pyotr Patrushev a most illuminating story teller as he lets us have a glimpse into his search of meaning." PYOTR PATRUSHEV worked for the BBC in London and as a science writer in Munich and San Francisco. He published numerous articles in The Sydney Morning Herald and The Australian and worked for the Australian radio and television.